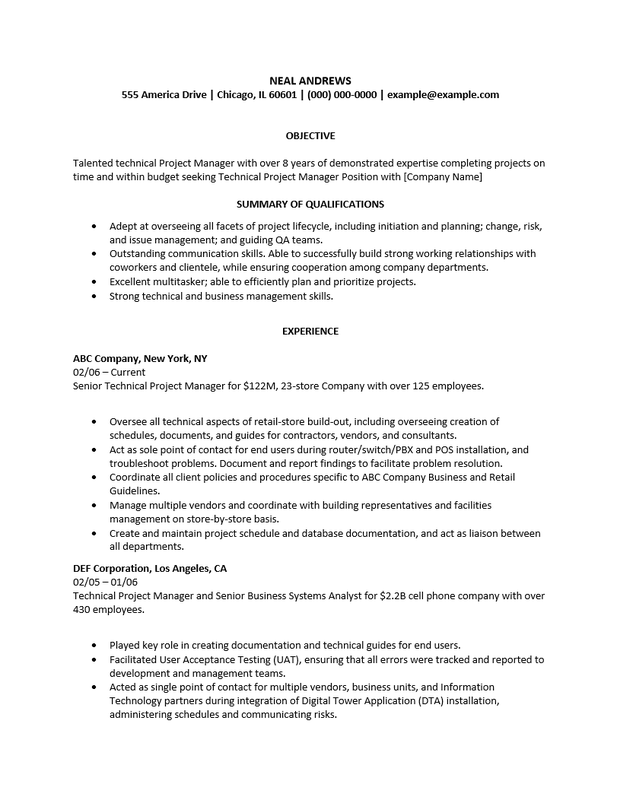 The Technical Project Manager Resume Template provides a venue for a clear presentation of the management and technical skills a Technical Project Manager must possess to attain a sought after project or position. The framework in the Technical Project Manager Resume Template can be instrumental in enabling a candidate to focus on writing a clear and professionally worded resume. Job seekers who take advantage of this tool have the advantage and ability to produce a competitive resume when seeking an interview for a sought after position. Step 1. Candidates will need to divulge quite a bit of information to a potential employer. However, the candidate’s professional information must accompany his or her Name and Contact information. This should be the first thing a recruiter sees when reviewing a resume. Enter your name on the first line of the page and your street address, phone number, and email address on the following lines. Step 2. Recruiters will be searching for something to separate an applicant from the rest. Since many Technical Project Managers will have similar credentials and experience, a well worded Objective may prove a deciding factor. This is written in the candidate’s voice and will summarize their skill set and achievements as they relate to the projects they are applying to. The Objective section should contain one to three sentences and should be written in a professional and communicative manner. Step 3. The Summary of Qualifications section will require that an applicants list why they believe their skills and experience relate to the position being sought. This should be a concise straightforward section. Step 4. The Experience section is often considered the main course of a resume. This will give potential employers a basis for accepting or denying an applicant’s ability to function or excel in the job they are applying to. Candidates should list where they have worked, how long they have worked there, the dates they were employed, the job title and their responsibilities there. Step 5. The Technical Skills section will be a list of the software, programming and networking languages the Technical Project Manager knows. Step 6. 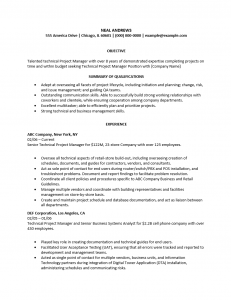 Candidates using the Technical Project Manager Resume Template should also fill out the Education section. Here, an applicant may let an employer know where and when they achieved their degrees and certifications.